Get Ready for this Awesome Challenge Course! 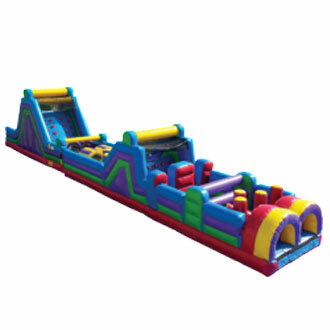 Description: Our 70ft long inflatable obstacle course rental is a great way to keep guest entertained at your next event. It features both our rockwall and slide, and obstacle course inflatable that give you 70ft of pop ups, climb and slide areas, as well as jumping areas. Call to book this awesome inflatable ride for your next event. Like all of our ride this inflatable meets NJ standards and is fully inspected by the NJ amusement ride division. Feel free to contact us with any questions.